“For Want of a Nail” is a Hugo nominee! I am very, very pleased to announce that my short story, “For Want of a Nail” is on the Hugo ballot this year. I got to sit in the crowd at Norwescon and watch the Hugo nominations be announced, live. This was a lot of fun. Especially when my name went up on the screen with the story. Heavens! This story originally appeared in the September 2010 issue of Asimov’s Science Fiction. To celebrate, we’d like to offer you the story. Edited to add: There is also an electronic version with bonus features, if you are interested. Details here. With one hand, Rava adjusted the VR interface glasses where they bit into the bridge of her nose, while she kept her other hand buried in Cordelia’s innards. There was scant room to get the f lexible shaft of a mono-lens and her hand through the access hatch in the AI’s chassis. From the next compartment, drums and laughter bled through the plastic walls of the ship, indicating her sister’s conception party was still in full swing. Rava rested her head against the smooth wood side of the AI’s chassis and closed her eyes, ignoring her brother and the f lat picture in her goggles. Her fingers rolled the slick plastic head of the cable, building a picture in her mind of the white square and the f lat gold cord stretching from it. She slid the cable forward until it jarred against the socket. Rotating the head, Rava focused all her attention on the tiny clues of friction vibrating up her arm. This was a simple, comprehensible problem. Rava reattached the camera’s cable to her VR glasses and waited for the f lat view to overlay her vision. The cable rested in its socket with no visible gap. She reached out and jiggled it. Rava sat on the f loor, breath coming in gasps. Her hands shook. Nothing about that conversation had made any sense. Her uncle had often been temperamental, but he’d also been eminently rational. This had been like talking to one of her nieces. Rava passed a hand over her face, sweating. Putting her finger on the wake up button, Rava pressed, the click vibrating under her f inger as a gentle chime rang. Rava kept her gaze fixed on Cordelia, whose image didn’t change. At all. For an AI programmed to act human, she became awfully rigid. Her face stayed fixed on Georgo, but the cameras f licked to Rava for a moment, then away. She softened and her image morphed so the high neck of the Victorian gown sank to reveal most of her bosom. “No.” Ludoviko laughed, breath catching in his throat. “I talked to him yesterday and he most certainly does not.” The air purif iers beat in the silence in the room. “You’ve been covering for him, haven’t you?” Rava’s whole body was shaking, but her voice sounded f lat and dead. Enraged, Ludoviko shrugged him off. Uncle Georgo reached for Cordelia, hands scrabbling. Ludoviko f lat-handed him in the chest, pushing with the full brunt of his strength. The breath coughed out of Uncle Georgo. He crumpled to the floor with a cry. The corridors had begun filling with the shift change crowd as Rava slipped through the door of the consignment shop. Behind the counter, Pajo sat on a stool reading, his bald head gleaming with a faint sheen of sweat as if he’d been running. Tidy ranks of shelves and racks f illed the room, each covered with the castoffs of generations, arranged into categories. Long sleeve shirts, paper, pens, cables, and a single silver tea service. Every family had brought only what they thought they would need, but even with finite resources, fashions changed. Between the towering shelves, Rava set Cordelia’s chassis on the f loor. She pulled out the box of cables and sat on the f loor beside the AI’s silent frame. The cables were bound in bundles, each of which had a fat hexagon on one end. The other ends varied wildly. Some were tiny silver tubes, others were square. One seemed to be an adhesive electrode. She pulled the cables out and tried them one by one. The third one slotted neatly into the port on Cordelia’s back. If only Rava hadn’t dropped the chassis . . . but the truth would have come out eventually. She stared at the last screen. For want of a nail . . . Tomorrow she would visit the consignment shop and get some paper and a pen. Oh, how awesome is this? Congrats, Mary! That is pretty much exactly what I said when I got the news. Thanks! I’m so glad you like it. That is such great news, Mary! Hearty congratulations!! Congratulations! I agree with Kathleen. I remember really enjoying that story when I read it last fall. Congrats, Mary. I’m very pleased for you! That’s a wonderful story, thanks for posting it. Congratulations on the nomination! Wow! Beautifully written and an intriguing premise. I had to look up the proverb but I love how seamlessly you made it all fit together. Brava! Congratulations, Mary. It’s a fantastic story and a well earned nomination. I love, love, love this Mary! I would love to see a novel length story of this ship and the people living on it! Great story. You might want to check for what appears to be errors in translation of ligatures. “fl” and “fi” all have spaces between then. For example “flexible” shows up as “f lexible” – “fight” shows up as “f ight”. Small nit for a great story. 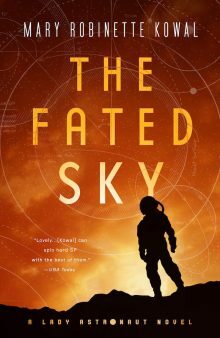 Wow… that has to be one of the most awesome short sci-fi stories I’ve read in a long, long time. I don’t know the other nominees to compare at this stage, but the nomination is very well deserved. Congratulations! It is truly a deserving story! Can you explain your choice of the title? I understand the proverb, but I don’t see how if relates to the story. For want of a cable, an AI was lost. For want of an AI, memory was lost. For want of memory, precious records were lost. There’s probably some missing links here, but you get the idea. Me too! This is a wonderful universe, and I’d love to see more about this family. I’d especially love to meet the personality of the new AI when it’s brought online, and has to come into a family damaged by all this, and deal with the circumstances surrounding its origin and the death of its predecessor. Hi Mary. I’m the editor of Science Fiction World in China. I just heard that you won the hugo award. Congrat, Mary! Well done, And well deserved. A beautiful story. Congratulations on winning the Hugo! A lovely story – and what a fun mash-up of cultural and technology bits! The story is from the future! “Her handy pinged”… Her HANDY?!? That is the German word for a cell phone. Origin of this use is unknown. How did that word slip back into English? I very much enjoy the story, thank you very much!